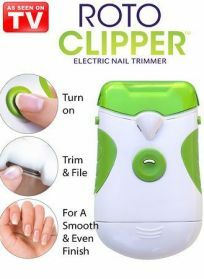 The Roto Clipper Electric Nail Clipper trims and files your nails at the same time. It's dual sided. 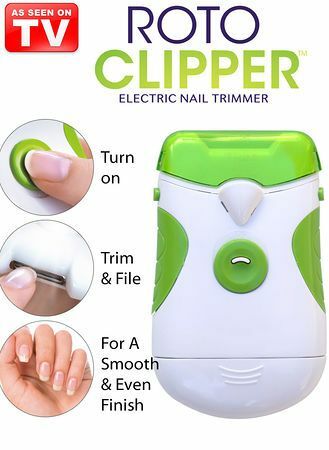 One side trims the nails while the other side files them. The durable, recessed beveled blades spin at 700 rpm to provide a smooth, clean finish. It's powerful, yet safe to the touch. The removable head detaches for easy clean-up. It's great for all ages. The led light allows you to see what you are doing. The ergonomic design allows for a comfortable grip that is perfect for arthritis sufferers. It's cordless and runs off 2 "AA" batteries (not included).